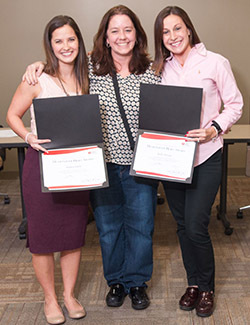 The Addison Fire Protection District presented Andrea Duffey, a second-year physician assistant student (far left), and Kelly, a nurse (far right), with American Heart Association awards for saving a woman’s life, Sandy (middle). Duffey had been standing about 20 feet from a go-kart that had spun off the track and wasn’t moving. Duffey ran toward the car and assessed the situation. The driver was suffering a heart attack, and had lost consciousness while driving. Duffey started chest compressions, and with the help of another party guest, a nurse, used an AED and CPR to revive the woman. In February the Addison Fire Protection District presented Duffey with an American Heart Association Award for her actions on saving Sandy’s life. While Duffey had performed CPR on three people during her clinical rotations, this incident was the first time she had performed it outside of a hospital setting and the first time being the one to assess the situation and make the decision to initiate CPR. “I was surprised at how easily the training came back to me when the situation presented itself. I knew what to do without second-guessing myself – it seemed almost automatic. To me this spoke volumes to the quality of training that I had received,” she said.